People just don't understand the moral danger we're in from this election. You need to know the real dirt about John Kerry and his family, before you vote. I've got the links to back up each of these allegations, or at least to point you in the right direction. Did you know, for instance, that while aboard his Swift Boat, with the American flag streaming from its stern, Kerry regularly engaged in piscatory activities with several of his crewmen — at the same time? In fact, Douglas Brinkley's Tour of Duty (at page 200) reveals that Kerry regularly permitted such activities to be conducted with exploding grenades! And they followed these activities with repeated gustatory rituals involving hot coals burned in a small grill. They actually bragged about this to crews from other boats. This from a self-described former altar boy — who, it's rumored, enthusiastically engaged in proselytism of homo sapiens, both while on and off of church grounds. And there are credible rumors that as a boy he took advantage of his family's foreign travels to become a practicing philatelist, too. I suppose that made his parents proud, do you think? 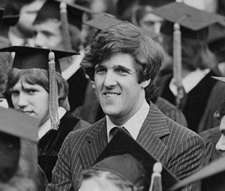 Why, did you know at Boston College Law School, John Kerry openly matriculated with each and every one of the young women students who began classes there at the same time he did? He did so publicly, apparently without any shame, and without getting their permission first or apologizing afterwards — even though he was already married himself, and some of them were too! Unfortunately, this runs through the whole Kerry family. Remember that "integrity, integrity, integrity" line from the debate? What would you think if you knew that John Kerry's mother was hospitalized at the time from complications related to her diagnosed status as a sexagenarian? What's more, his daughter Alex is a self-admitted practicing thespian, and has even accepted money for public performances of such acts! Indeed, you can purchase videos of her public exhibitions of thespianism on certain internet websites, which modesty forbids me to link. Shockingly, Kerry and his wife regularly permit, even encourage, their male and female children to masticate in each other's presence at the dinner table! Some of the mastication is rumored to involve Heinz Ketchup, believe it or not. Apparently, Sen. Kerry and Ms. Heinz-Kerry think these practices are "safe" and "normal" so long as the children use condiments. Finally, the entire family have been shamelessly taking part together in hortatory activities, all over the campaign trail! In fact, if you look closely at film clips from the campaign, you can see that Sen. Kerry engaged in what has presumably been consensual osculation with not only his wife, but also his adult daughters, repeatedly and on a public stage. He makes this a regular part of his campaign appearances, and the audiences all cheer! Whether Sen. Kerry's cheeky display of osculation with First Lady Laura Bush's most accessible integumentary organ after each of the debates was consensual or not, I suppose we'd have to ask her. At least, unlike Al Gore's activities with his own wife in the 2000 campaign, Sen. Kerry hasn't been observed in lingual osculation involving his own wife's, or any other woman's, sulcus terminalis or oropharynx. But who's to say that won't happen the next time they're on stage? Is Bill Buckley your ghostwriter? The amusing thing will be to see who gets offended. I don't know. We played this game in junior high. But is he an infralapsarian or a supralapsarian? a disestablishmentarian or an antidisestablishmentarian? We know he is a practicing rodomontade, but does he ululate in public? Or is he a confirmed inhibitionist? I HATE it when he does that... y'know...the matriculation and... eh... stuff. On a slightly different note, though still in the vein of Kerry offending people, how is Kerry going to reconcile his Presidency, assuming he wins? He's made a lot of promises to a lot of people and many of those promises are not just contradictory but mutually exclusive. Yet many of the people voting for him are simply telling themselves that he's just saying, what they don't want to hear, just to get elected. So, assuming Kerry gets elected, how much gnashing of teeth and frothing of anger will there be in the first part of 2005? Just on one issue alone he's almost guaranteed to have serious problems. Gay marriage. Gays are thinking that Kerry is just spouting rhetoric to get elected. Voters opposed to gay marriage are thinking that Kerry is dedicated to their pov. If Kerry stays opposed to gay marriage then the national gay organizations are going to pretty much freakout. If Kerry does a hard left turn and abandons restrictions on gay marriage then he is definitely going to offend any number of conservative christian voters, many of whom are black. Is this thinking wrong? Am I missing something? Are there other examples? The Washington Times has reported that his wife, "shared a ski instructor". Very funny and appropriate, given the current political atmosphere. Thanks for the laugh, I needed it. Yes that George Smathers. He was the buddy of JFK in the Senate. George Smathers really knew John F. Kennedy and John Kerry is not JFK. Ran against Claude "Red" Pepper for the senate in Florida in 1952. Dazzled and shocked crowds in Florida when told them that Pepper had Matriculated at Harvard. Smathers won in a landslide. All right, Beldar, this time you've gone too far! I take it as a personal affront that you've blurted to the whole world that John Faker Kerry is a former philatelist. As a current practitioner of that arcane art form, I feel besmirched by such an association. Now I'm going to have to go through and remove all the stamps from my collection with the initials "JFK" on them, and hide them from public display. At least we are spared the ultimate humiliation - that he STILL partakes of such activity. I might also remind you that the last president that was a practicing philatelist was Franklin D. Roosevelt, and we ALL know what kind of a mess he made of the government. Pretty funny. I remember a similar shtick from Mad magazine back in the '60s. But you left out the part where the Republican machine is going to disenfranchise dead people, illegal aliens, and mythical characters. I am shocked, absolutely shocked, by this truth. Would you please apologize and allow me to hold fastly to any liberal illusions still permitted. If you squint a little and think about it, you guys are actually ridiculing a small segment of the voting public who are trusting, but lack the sophistication to know it is a joke. I too remember it from my (misspent) youth! Everytime I see Kerry on TV, I have to have a laugh. Kerry, has the sissy look, and can only say, "Im bringing the jobs back home." Why hasen't he done anything to help us workers, when he has been in Washington this long? Its easy to say these things to people, when your second wife is a millionair. He has never worried about food, electricaty and water, or any medical bills. Bush to. He has had a golden spoon in his mouth to. We as a people, have become so stupid, our leaders have caught up with us. Has anyone heard about the national debt lately? NO. And you want. Thanks, but Im getting sick at my stomach.